Bridgeport, WV September 27, 2010 – WVDOH District 4 (Bridgeport) construction crews installed Mechanical Concrete® to repair severe erosion on WV 279. WV 279 is a four-lane limited access freeway that connects I-79 and the FBI Complex to US Route 50 east of Benedum Airport. Like all roads rain eventually washes away portions of the shoulder, often creating drop-offs at the edge of the pavement. 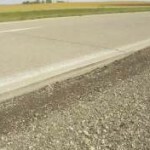 The drop-offs can become safety hazards for drivers and accelerate pavement deterioration. This work is part of a larger research project under the direction of John Zaniewski, Ph.D of the WVU College of Engineering and Mineral Resources to study shoulder stabilization technologies. In addition to Mechanical Concrete® the project used asphalt emulsion (RS-2), a honeycomb stone containment product Geoweb (geosynthetic), Type III Portland Cement full depth cement soil stabilization and #3 AASHTO stone. in Doddridge County for WVDOH while he was County Supervisor. The proposal defines the granular shoulder problems which all highways generate. Granular shoulders have two common problems which inhibit their effectiveness at providing a smooth transition for a wandering vehicle, washout and drop off. 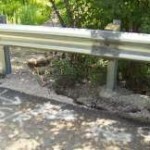 Washout occurs when hydraulic forces of stormwater runoff remove part of the pavement shoulder as shown on Figure 1. Lane-shoulder drop-off, Figure 2, is the result of displacement of the granular shoulder by vehicle action. Both washouts and lane shoulder drop-off cause a maintenance problem for the highway department and a safety issue for the traveling public. The safety issue generates a liability issue for highway agencies. The potential liability issues are particularly significant in West Virginia with the preponderance of steep grades, sharp curves and narrow lanes.